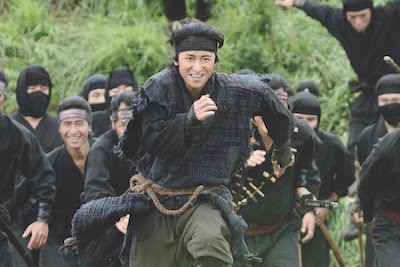 My take on MUMON is not the typical one, with the result this piece may confuse many of you. I'm sorry. For while billed as a comedy I don’t see MUMON as one. I see it as a dark satire…though it’s probably more a grand tragedy where everyone ultimately loses, despite some people walking away. Once events are set in motion it becomes a game where there will be no winner and even if they are still standing at the end in the long term they will have lost. The plot of the film is actually quite difficult to describe simply. Nominally the film is the story of a ninja named Mumon who is paid to kill the second son of one of the rival clans during a skirmish. This sets in motion a series of events that will play out when the land of the ninja is invaded by the samurai. I am going to forego trying to explain anything further because like a great work of literature there is a great deal going on with numerous characters and their subplots running through it. Trying to simply explain it is not really an option. I really love this film. This is a film that has gotten better the more I've thought about it. Its a film that is so much deeper than the action comedy it seems to be it is operating on any number of levels. While the film is billed as comedic with a touch of pathos (per director Nakamura) I found the humor not really funny, there is a bleak edge to what is happening that once you see it makes it hard to laugh. Make no mistake the film is largely a comedy, the gentlemen around me were roaring with laughter all through it. There is no way I can say that there are not numerous funny and bits and some wonderful action set pieces. I smiled and laughed, but more often the checkles caught uncomfortably in my throat. I largely just sat staring at the screen. I saw the humor of the actions but I also saw it as warning of the dangers of a world at constant war. It’s a world where life means nothing and where men kill just for the hell of it. No one cares because there is a very real sense we all could be dead tomorrow (largely because no one cares). While the film is billed as a comedy with a touch of pathos (per director Nakamura) I found the humor not really funny, there is a bleak edge to what is happening that once you see it makes it hard to laugh. Making it more damning is the fact that world events have caught up with its world view where all our leaders are corrupt (at least here in America). What the ninja lords are up, a grand grab for cash at the literal cost of their sons is horrible. While the film has been a long time in production the fact that the film arrives as Donald Trump and his cronies are setting about raiding our countries coffers, while edging us to further religious conflict and war with North Korea makes the film a frightening and prophetic look at the state of the world’s politics. It is in no uncertain terms a film in par with the greatest anti-war satires such as DR STRANGELOVE or the under appreciated WRONG IS RIGHT. While the main action of the film has to do with the move of a samurai lord to take the land of the ninja, who are considered beasts and are not to be dealt with by humans (they should be left to dwell in their swamp), the film is actually quietly posing a good number of very serious questions that made the film incredibly heartbreaking for me. The film’s most obvious theme is the notion of doing anything for money. Everyone wants to money for one reason or another. The samurai want to maintain their control (they want the tea container because of its value). The ninja want money because it’s money. Even our hero, Mmon, works for cash. No one has any honor where money is concerned. Worse if you are doing anything not for money you’re doomed. This view of money being at the center of everything makes this one of the most cynical films I’ve ever seen. It’s a fact reinforced by the huge body count of the film. The sheer lack of caring for anyone makes this a bleak film. Almost no one really cares for anyone. Anyone who does care is bound to have the person they love die. Loyal retainers are forced to kill their lords, brothers watch as siblings die and their deaths are joked about and lovers are doomed never to consummate their love, killed at the moment they realize that there is more to life than money. If you do anything for any reason other than money, say a genuine love of country, that will blow up in your face. Late in the game the as half of the ninjas are fleeing the invasion Mumon has a change of heart and decides to fight for his home land. Luring everyone back with the promise of a huge payday he rallies the troops who win the day but because because this world shits on good intentions it results in only pain and sorrow. Ultimately no matter what we do for any reason it will end badly. The only thing one can do is hunker down and blend in…and maybe make some money while not caring about anyone. The intriguing thing about the film is that in light of the President Trump’s anti-immigrant notions concerning a wall and restricted access the film could be seen as a perfect excuse why we should exclude some groups (the ninjas are beasts who once they are allowed in bring down the samurai). It’s a sad commentary that makes perfect sense in context of the film. While many applauded the films bittersweet nature of the film, my heart was simply broken by the underlying sadness of it all. If you look past the humor Nakamura has made a shattering portrait of the world today. It is a bitter pill that while wrapped in the sweetness of humor is in fact a clear eyed look at how far we have fallen. There is no honor, there is no goodness, there is only a striving to just survive. As with the many of the great films which hide dark warnings in over the top horror or humor MUMON screams out about the dangers of our world. Not to put too fine a point on it MUMON is a masterpiece. Hi! This is Yumi Nakamura. I read all reports! And I really enjoyed! My husband also appreciate for your deep understanding about his movie. I wish I could say thank you face to face.